Seattle weather is sunny, with a high near 75 with South Southwest wind 5 to 7 miles per hour and becoming calm. There are five different ways to steer NOAA Ship Rainier using the rudders, or vertical blades submerged in the water. All methods rely on a steering pump to activate hydraulic fluid to move the rudders. Three different methods can be done with electricity from the Bridge, or the front windowed area of the ship. The first electrical method is autopilot which simply sets the course of the ship. The second method is hand and helm which uses a wheel to steer the ship. The third method from the bridge is called non follow up and uses a dial to mark the course. The other two methods utilized occur from back of the ship, or the aft, and include the electrical powered trick wheel and manually operated hand pump steering. 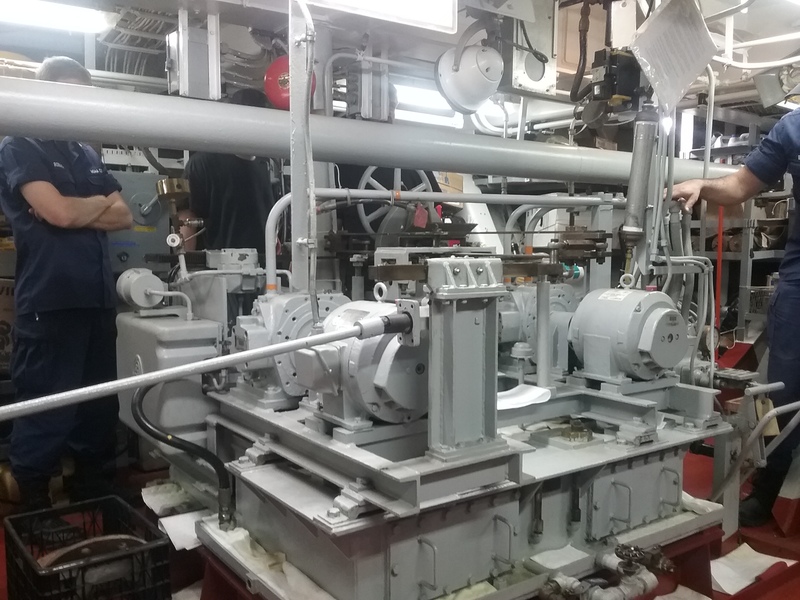 Steering allows you to follow a course and can efficiently be done by using the two rudders which are located behind the fifteen foot propellers on either side of ship Rainier. The left-hand, or port side, rudder and starboard, or right side, rudder steer the ship using water pressure. When the rudders are straight the water moving from the propeller to the rudder will keep the boat moving directly forward. When the rudder moves to the right, the back of the boat moves to the left which moves the bow of the boat to move towards the right. The rudder moves in the direction of less pressure, causing the stern and boat to move in that direction. Trick wheel steering uses electricity to power the steering pump when steering cannot be done from the Bridge. It uses hydraulics which creates power from oil pressure to move the rudders. Rainier is a 50 year old ship that still functions on hydraulics, while most modern ships use low initial cost, simple design pneumatic which uses a compressed gas to create the fluid pressure. In order to activate trick wheel steering at the aft, a toggle pin must be removed to disconnect steering from the bridge and a gear must be put onto its thread. A sound powered phone that doesn’t require electricity operates by using the sound pressure from a person’s voice to create an electrical current which is then converted back to sound by the receiver. This allows for communication of the course to steer between the bridge and the steering aft. The instructions include a degree and a left or right rudder command. The steering system on the ship is run on hydraulics, whether the steering originates from the bridge or the aft. There are three solenoids at the controller which change electrical power to hydraulic signals in the aft. Solenoids are also in the transmissions of cars and are coils of metal in a helix shape that act as electromagnets. The energy generated from the solenoid moves a shaft with gears that is connected to two pumps. The fulcrum connected to the navigation bar moves from the power generated by the change in pressure from the liquid. The one pump activated pushes hydraulic fluid to the rudder pumps which then move the rudders and steer the ship. Each pump has cylinders and pistons inside of it with the hydraulic fluid, or oil, that creates the change in pressure for the closed system to work. Amanda Flinn, hydrographic survey technician, has a smile and laugh that makes you feel readily welcomed. When I first met her on Saturday in the mess room watching Game of Thrones, her friendly demeanor immediately put me at ease. I thoroughly enjoyed getting to know her on our walk to Pike’s Marketplace which was filled with moments of genuine laughter. Amanda is a sincere individual with a vast understanding of hydrography. Amanda’s knowledge about surveying has been accumulated over the past eight months that she has worked on Rainier. Her passion for data processing and map generation became apparent after chatting with her in the Holodeck, the annex survey space behind the plot room on the F deck of Rainier. She shared several maps that were generated from the Channel Islands’ project that was conducted over a six to eight week time period. A highlight of her first survey in the Southern islands of California, included observing the island of basalt rock columns at Castle Rock. Amanda’s passion for rocks led her to study Geoscience with a minor in Oceanography at University of Connecticut. Her college experience in the state where she grew up prepared her for her current surveying position. Her responsibilities during surveys include collecting data in launches and processing data in the evenings. 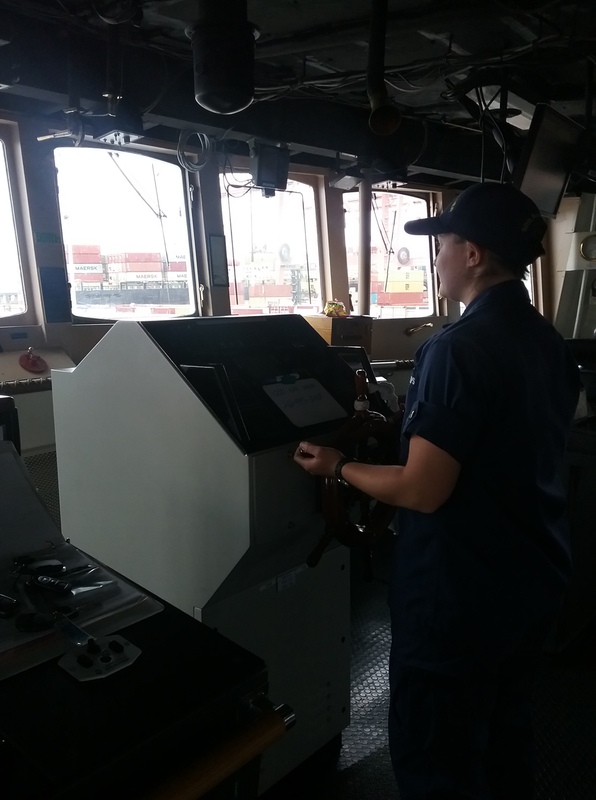 Amanda’s recent promotion from assistant survey technician to an H.S.T, or hydrographic survey technician, proves her competency. Amanda learned about a job opening with NOAA after her first harp performance last June while living in New Hampshire. She serendipitously met a woman married to a survey technician on the Thomas Jefferson, another NOAA vessel that had a position opening. Since Amanda was looking for hydrographic work, she took a bus into Boston to explore the survey vessel and liked what she saw. She eagerly applied to NOAA and soon had a phone interview and was asked her ship preference. Since Amanda wanted to explore the West coast and travel to Alaska, she chose S-221, survey ship Rainier. Amanda was hired in October and has loved her experience of sailing on a ship and being on the ocean. One of her favorite parts about surveying includes getting up close to rocks on the launches, or small boats when surveying. While some people find it challenging to be away from family, Amanda appreciates the sea exploration that takes her to natural scenery along the West coast with beautiful sunsets daily. Since she loves it so much, she can see herself continuing to call Rainier home for several more years before returning to live on land someday. Amanda became qualified in data acquisition last October and began her first round of surveying at the Channel Island Marine Sanctuary in November. A typical day out at sea when surveying includes waking up, eating breakfast, meeting on the fantail, surveying on launches all day with a break for a soup and sandwich lunch. This is followed by eating dinner and beginning evening processing. The sheet manager assigns different sections and prepares all data for the next day. While being out in the launches and collecting data is her favorite part, Amanda also enjoys processing data. She utilizes Caris and Pydro-Explorer, software Pacific Hydrographic branch has developed for NOAA ships to remove noise from the pixelated images of the two and three dimensional maps generated from the surveys. For quality control, she completes cross lines tests and junction analysis to ensure that new and old surveys match up. 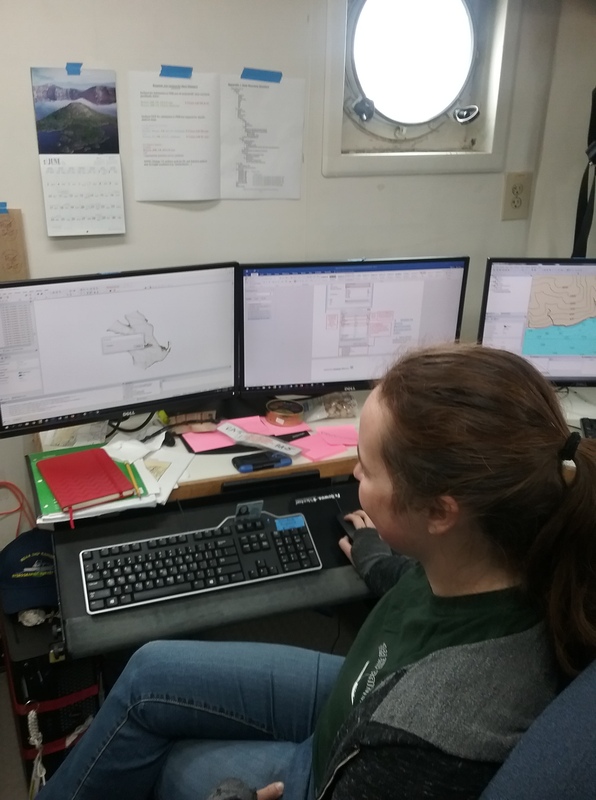 Amanda worked on data processing in Newport, Oregon while the ship was dry docked in Portland for the winter season and hopes to complete the report for the Channel Island survey soon. 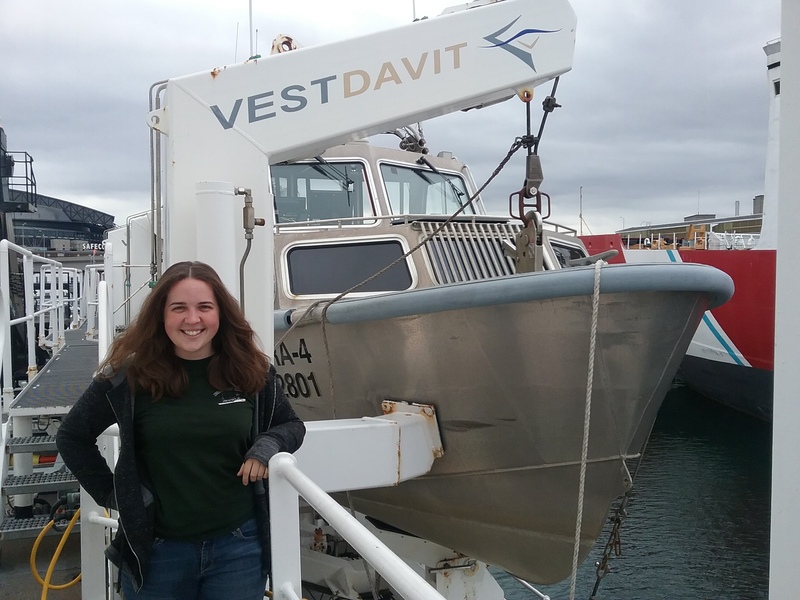 This entry was posted in 2018, Heather Oconnell, NOAA Teacher at Sea and tagged engineering, hydraulics, interview, noaa ship rainier, steering, Survey Technician. Bookmark the permalink.